Crashteams experts provide accurate and scientific forensic animations as a standard deliverable on any case where the reader must understand the relationship between time, distance, and motion. How else can anyone understand an event that happens within the time span of a few seconds? Crashteams experts can deliver a “draft“ animation movie by email attachment at any time as the case progresses to assist you in understanding the event, and provide your input on where the animation view points or cameras should be located. Above is an example of an animation report generated by the software program, FX3. Other programs generate similar reports and all animation movies should be accompanied by a spreadsheet of this sort. Note this spreadsheet informs the reader of the point in time to 1/20th second, stating the x,y,z positions as well as the yaw pitch roll orientation and velocity. This should be standard. 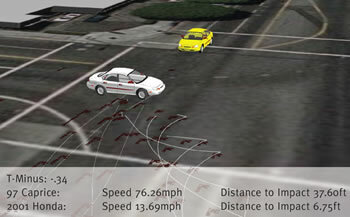 The animation as it runs, should display the time and some positional information so that any image captured from the animation sequence will demonstrate accurate object placement in time (see image above). Note also in the animation frames (above), an air photo is used as the background. Total station measurement points also appear on the scene giving the viewer further confidence that the animation is based on real measurements and calculations.